Princeton, NJ - May 30, 2017 - The Arts Council of Princeton announces Princeton’s next parklet, a public installation built to transform curbside parking spaces into beautiful, lively spaces for the community to enjoy. Installed in front of jaZams along Palmer Square East, the new parklet will be an interactive structure with an “energy playground” theme. Visitors to the family-friendly parklet are invited to explore and participate in active energy creation and visualization, utilizing a variety of energy generation technologies to inform the community about the importance of renewable energy in a fun, play-driven environment. The structure will be divided into 5 ‘rooms’: a Bike Room with repurposed bicycles connected to generators to power jaZam’s storefront display; a Reading Room with a community library stocked with books donated by the Princeton Public Library; a Game Room with various games and toys provided by jaZams; an Engine Room with multiple power-generating opportunities to power parklet lights and fans; and a Sun Room to gather and relax. The public is invited to the Opening Celebration on Saturday, June 10 from 3-5pm at 25 Palmer Square East in Princeton in front of jaZams. This parklet was made possible by the dedication and support of lead sponsors: jaZams, Joseph Hobart Weiss Architect, NRG Energy, Hamilton Building Supply, and Princeton University’s Andlinger Center for Energy and the Environment. The project was also made possible by Davidge Design Studio, Kopps Cycles, MacLean Agency, Nassau Inn, Princeton Public Library, Thames & Kosmos, the Town of Princeton, Smith’s Ace Hardware, Sustainable Princeton and Terra Momo Restaurant Group. This parklet follows the success of the Arts Council of Princeton’s first parklet installed in front of small world coffee on Witherspoon Street from May-October 2015. 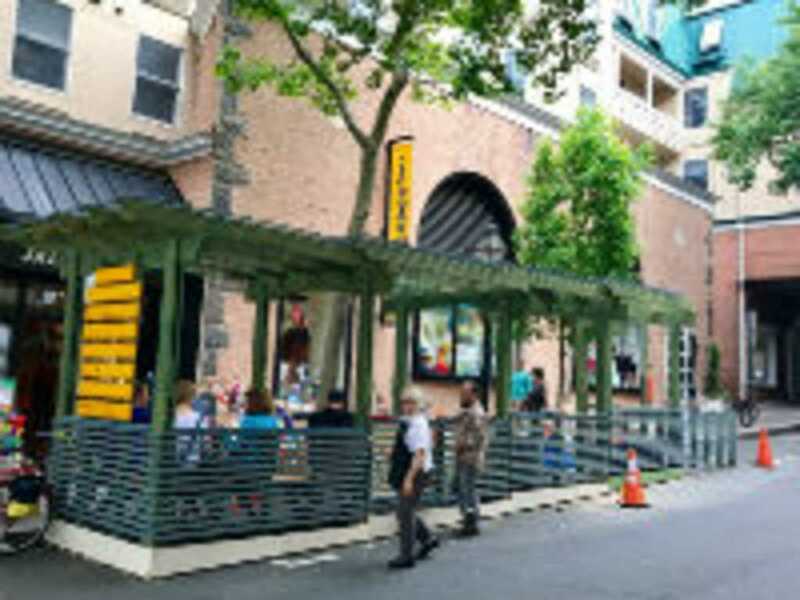 Mayor Liz Lempert and the Town of Princeton approached the Arts Council of Princeton (ACP) to assemble a team to facilitate the creation of a parklet in Princeton, similar to those found in major cities such as New York, San Francisco, Philadelphia, and Seattle. Ms. Evans and the students from Stuart Country Day School she was teaching at the time collaborated with a team comprised of Princeton Government&apos;s Lee Solow, the Princeton Public Works crew, George Akers of Material Design Build, architect Kirsten Thoft, Mike Hathaway of Revival Construction Co, landscape artist Peter Soderman, and small world coffee owner Jessica Durrie, to make Mayor Lempert’s vision a reality and build a beautiful parklet for the town to enjoy. For more information, please contact the Arts Council of Princeton at 609.924.8777 or visit artscouncilofprinceton.org.